You are currently browsing the tag archive for the ‘East Park’ tag. Easter weekend has arrived. It’s time to get together with family, paint brightly coloured eggs, find chocolate ones left behind by the Easter bunny or step into church for a little of the gospel and a whole lot of thankfulness for the life you have. There are still celebrations for those who do not celebrate Easter though, as Passover is still going on for those of Jewish faith, with the holidays winding down on Tuesday. And the best reason to celebrate of all is that we are expected to have sunshine on both Friday and Saturday this weekend, with temperatures finally climbing above 0°C! Now that is a reason to celebrate! For those that will be celebrating Spring, Easter, Passover or just the glory of “the long weekend” in London, Ontario this weekend, here is a sampling of things that you can do to entertain yourself and the family. Fun for the whole family, regardless of your faith, will be had at East Park this weekend. While most places will be closed during the holidays, East Park is opening their doors from 1-9 pm on Good Friday and Easter Monday. On Saturday and Sunday, their hours are 11 am – 9 pm. Don’t get too excited by the sunshine though. The splash park won’t be open for a while yet, but there is still plenty of fun to be had inside at Intencity. Think rock walls, bumper cars, a jungle gym and arcade area, all for $20 per person for a 2-hour pass. Now how is that for a deal! If you would rather get outside to enjoy some fresh air this weekend, how about a trip out to Hensall to take in the Iceculture Experience Tour? I can guarantee this is an adventure you have never experienced before. They will be open Easter Monday from 10 am – 4 pm and the cost is $14 per person. You can learn how clear ice is made, watch an ice sculptor in action, see precision instruments that can carve through ice to create unique pieces, chill in the ice lounge and of course take a ride on their 50 ft ice slide. The tour lasts 90 minutes and I have heard rave reviews from anyone that has gone, so set your GPS to 81 Brock St in Hensall and don’t forget to shoot me a picture to share your day. Of course you might want to schedule an Easter egg hunt or two into the fun as well. You are in luck, as I know of at least two places that will be holding Easter Egg hunts over the weekend. The first will be on Good Friday, March 29th, 2013, from 9:30 am – 1 pm at Fleetwood Farms (Middlesex Agility Club 9282 Elviage Dr). It is the 2013 Annual Easter Egg Hunt for Dogs and their Families as sponsored by the National Service Dogs. This great event raises money for the National Service Dogs and their work with people with Autism and/or special needs. Registration costs $25 per family. You can even donate Canadian Tire money or your lowly pennies that are now being phased out. The hunt begins at 11 am and goes on rain or shine. So bring your pooch to sniff out some of the plastic eggs that will be scattered about and filled with treats for both you and Fido – a milk bone and a sticker with the potential to win you one of hundreds of great prizes. Doesn’t this look like fun? I think your kids and Rover will agree, so register now (on the day of the hunt is ok too)! 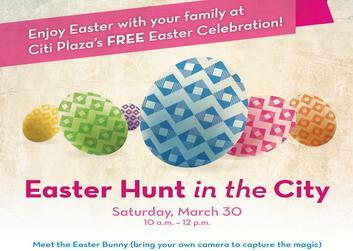 One last event is the Annual Easter Egg Hunt at Citi Plaza (355 Wellington St) on Saturday, March 30th from 10 am -12 pm. Meet the Easter Bunny, do a craft, take part in a scavenger hunt and most importantly, have FUN at this free event. 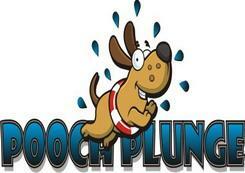 There will be goody bags for the kids, music, prizes, discounts and more. Whatever you get up to this weekend, I hope you enjoy the long weekend!